The objective of EWF is to promote the interests of the warehousekeepers and to unify and improve the quality of warehousing services throughout Europe as well as creating a European level playing field in legislation concerning the warehousing sector. 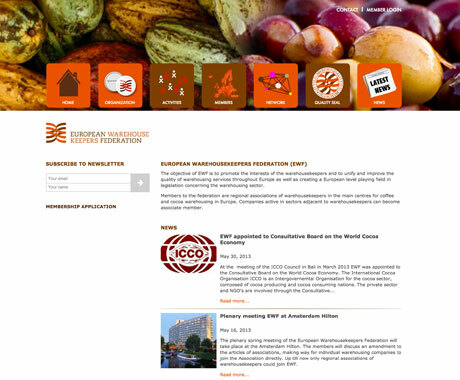 Members to the federation are regional associations of warehousekeepers in the main centres for coffee and cocoa warehousing in Europe. Companies active in sectors adjacent to warehousekeepers can become associate member. Website met een eigen custom made template in Worpress. De site heeft een besloten deel voor de leden.